Women of reproductive age (WRA) are often nutritionally vulnerable because of the physiological demands of pregnancy and lactation. Requirements for most nutrients are higher for pregnant and lactating women than for adult men. 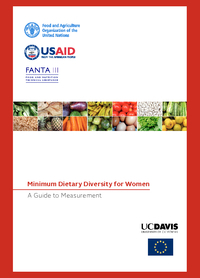 The Minimum Dietary Diversity for WRA (MDD-W) 3 indicator defined and described in this document is a food group diversity indicator that has been shown to reflect one key dimension of diet quality: micronutrient adequacy, summarized across 11 micronutrients.